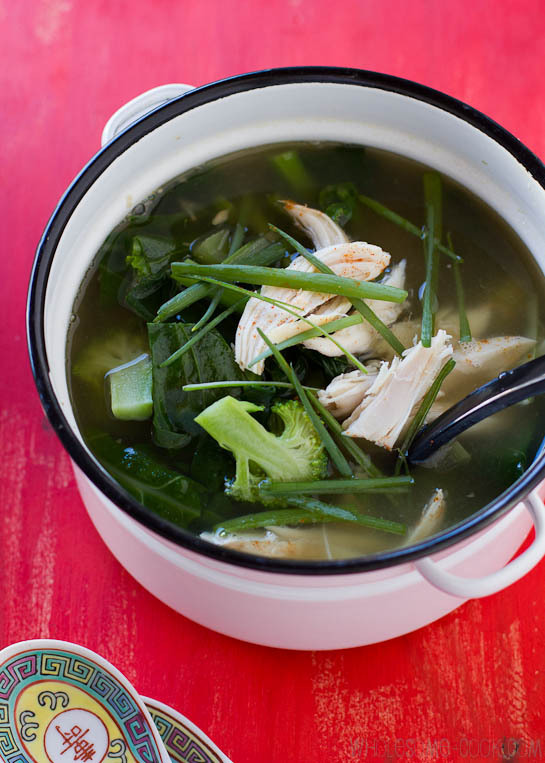 My Healing Chicken Soup with Greens, Lemongrass and Ginger is a tasty flu-fighting concoction that’s ready to eat in less than 30 minutes, because when you’re sick the last thing you want is standing around the stove. (Gluten-free, dairy-free, egg-free, nut-free, soy-free, Paleo). 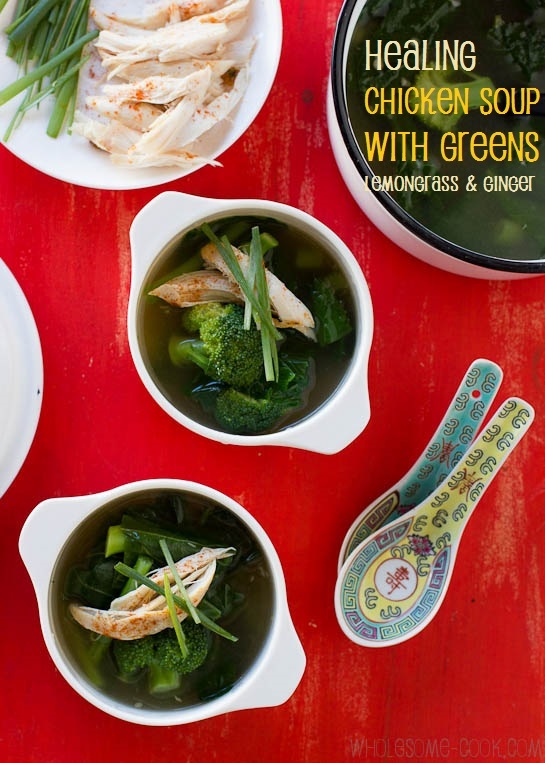 I call this soup healing because it combines the comforts of the traditional Western flu remedy that is a bowl of hot chicken soup, with plenty of greens and a good measure of lemongrass, ginger and chilli inspired by the Asian flavours of Hainanese Chicken Rice. These tasty additions are not only fragrant and warming, but they also are said to have medicinal, flu-fighting properties and aid digestion. It is exactly what my body needed when I came down with the worst viral cold I’ve had in a long time… Lots of rest and time were prescribed by the doctor, but how was I to rest with a house move in 2 weeks?? Luckily, both Mr Chipconnoisseur and the children were away for a week so I did manage to relax my schedule a little. The worst part of it all was that for a few days, I could not taste a thing, which meant less time spent in the kitchen and more time to rest pack up the house for our impending move. While I used ready-made barbecue chicken I went for the free-range variety and used Stock Merchant’s Free-Range Chicken Stock to make the soup more wholesome. As for the greens, anything goes really, but make sure to add a couple of sprigs of sliced spring onions – they have similar properties to garlic! 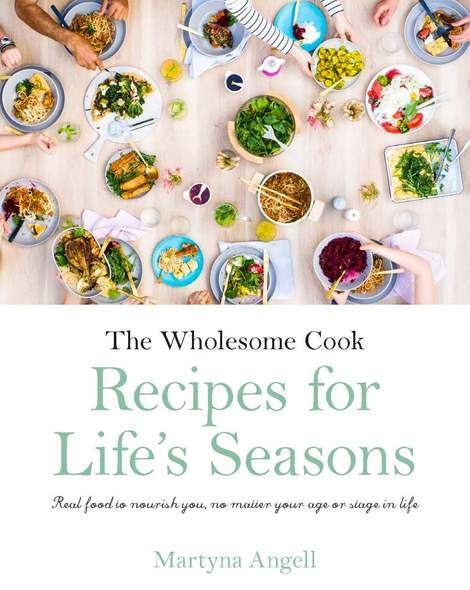 If you think Wholesome Cook is worthy of a mention in the Healthy Eating category, go to this link and leave a comment that includes: blog name and category – healthy eating, link to the blog (www.wholesome-cook.com) and a short description of how Wholesome Cook helps others to live a healthier life. Thank you in advance and you know I will love you for mentioning me, right? 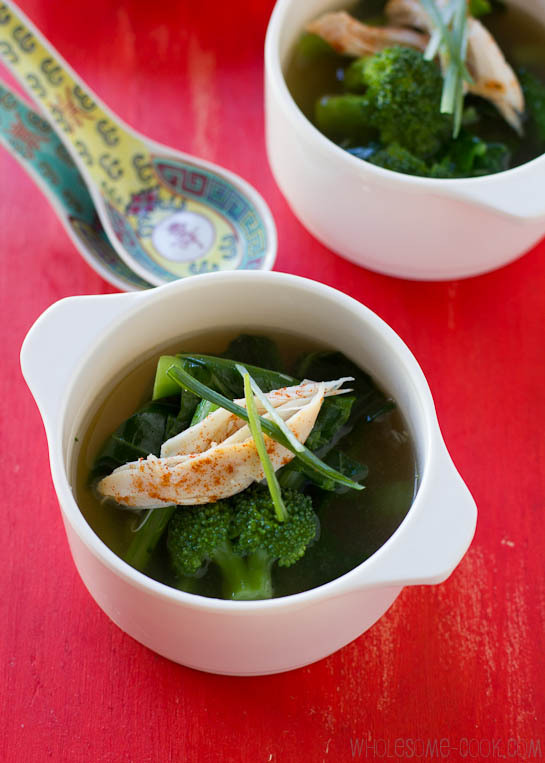 While I used ready-made barbecue chicken in this Healing Chicken Soup I went for the free-range variety and used Stock Merchant's Free-Range Chicken Stock to make the soup more wholesome. As for the greens, anything goes really, but make sure to add a couple of sprigs of sliced spring onions - they have similar properties to garlic! Peel skin off the chicken, set aside. Pick meat off the bones and shred, set aside reserving bones. Heat oil in a medium stock pot over medium heat. Add lemongrass, ginger, garlic and spring onions and cook for a minute, until fragrant. Add stock and reserved bones and skin off the chicken. Bring the stock to a boil, lower heat to a simmer and cook for another 5 minutes, for the skin and bones to impart extra flavour. Remove bones and skin from the stock with a slotted spoon and discard. 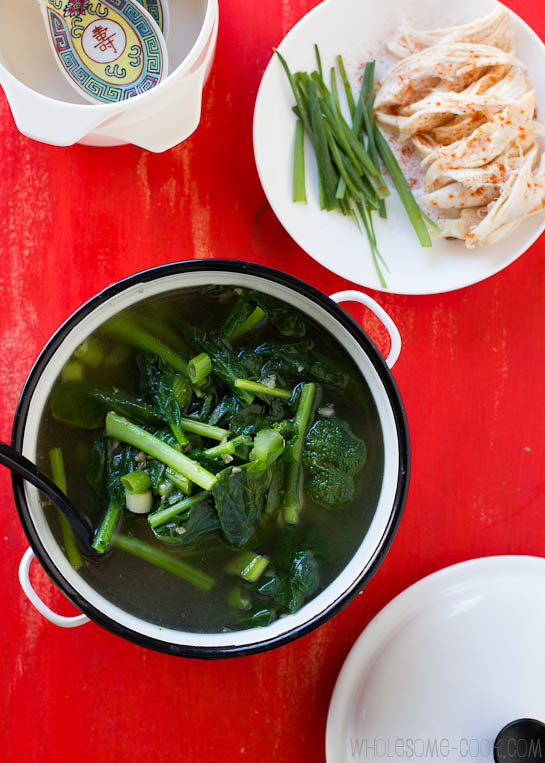 Now add prepared Chinese broccoli and broccoli florets, cook for 2 minutes. Add baby spinach leaves and season the soup to taste with sea salt and pepper. 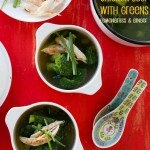 Serve hot Healing Chicken Soup with shredded chicken (dusted with chilli, if using) and extra spring onions. Martina, Thanks for sharing, just in time for Winter 🙂 I’ll have to try the Stock Merchant Brand. I always buy free range eggs and can now extend this to stock. Will have to track down where to buy it. I picked mine up from one of the food shows as they were exhibiting but they are pretty well stocked across the Sydney metropolitan area. You can checkout their stockists page. Lovely chicken soup! I really like the addition of the lemongrass and ginger. Have a wonderful week Martyna! Wonderful reminder of how much natural remedies can do! I have written on this subject many a time and, tho’ no proponent of freezer cooking, actually suggest one makes a large batch of this flu’ and cold-limiting soup early in the season and freezes it! A number of US and European Uni professors agree! I must admit I make my own stock and then the soup! Love your use of broccoli and spinach which I have not. I do use a lot of sweet potatoes and other root vegetables like parsnips. Garlic: 🙂 🙂 🙂 I would probably use triple 🙂 ! Have not made a large batch as yet: may try half your way: thanks!! Wow that looks really healthy. Definitely a must try even without any ailments. When eating a warm bowl of lovingly made chicken soup I can practically feel it building my blood, nourishing my cells and singing to my soul. Healing on so many levels! I will have to give this recipe a try! Sounds superb Marty… I have a sore throat… do you home deliver? I wish I lived nearby as I would definitely deliver to you. Hope you feel better soon Liz.